Home » Griddles, Grills & Fryers » Fryers » What is the Best Deep Fryer for Home Use? If you love French fries, chicken wings, onion rings and other varieties of deep fried food, then having a deep fryer in your kitchen is essential. If you are looking forward to buying an electric deep fryer, we’re here to show you what the top rated deep fryers are. While a deep fryer is considered by many as not a must-have appliance for a kitchen, most people are pleased with its convenience and enjoy the different types of fried treats it can make. There are several well rated models you can choose from on Amazon. Even as there are numerous models of deep fryers in the market to choose from, only a few are really worthy of your cash. To help decide on the best deep fryer for home use, these are the things to take into consideration: whether or not the model is easy to clean and use, the amount of space it occupies, whether it creates a lot of oil splatter and odors, and how quick it is to reach ideal frying temperatures, amongst other factors. Also make sure that the power cord attaches to the unit magnetically instead of via the usual plug, as this ensures that if something or someone snags the cord and drags the unit with hot oil in it, the unit is immediately unplugged before it can start a fire. Of course, deep frying on a regular basis is not a healthy thing to do. If you want to satisfy those cravings but keep calories low, consider getting an oil-less fryer that is almost as good. This review will help guide you through the best deep fat fryers for home use. 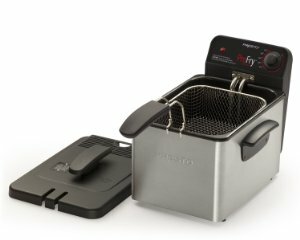 The Presto 05461 comes with a large 8-cup oblong-shaped frying basket perfect for frying long items like chicken and fish, and this unit heats quicker compared to most fryers available on the market due to its 1800-Watt immersion element. National Presto 05461 also has an adjustable thermostat that allows variable temperature control and includes an oil-ready indicator light. The fryer’s cover prevents oil splatter as the basket lowers into the oil and it has an odor filter built into it. The Presto 05461 is perfectly designed with qualities that you will love, including a removable enamel pot and heating element for easy cleaning and maintenance. On top of that, they are dishwasher safe. Its dimensions of 20”x10.5”x10.25” enables it to occupy a small space on your kitchen counter. The large deep frying basket makes Presto 05461 perfect for families and also allows you to fry a considerable variety of foods. Above all, it is easy to set up and use. Most users say that this fryer performs extremely well for the price and the temperature control is very accurate. The one thing they advise is to not fill the fryer to the maximum line as there’s a chance of boil over at very high temperatures and also it does not allow the bottom of the basket to stand clear of the oil line when you lift it to drain. If the above Presto is too large for your needs or you want a fryer for just small foods, the low-price Presto 05442 CoolDaddy is an efficient culinary appliance to your home and perfect for about 6 servings. This unit fries anything from shrimp to chicken and more. It has an external basket-lowering handle and locking cover to prevent grease spatters, and a charcoal air filter prevents your home from being overpowered by the frying smell. The wire mesh basket features small holes, so you can deep fry even small foods and stray batter bits won’t fall through into the oil. Presto 05442’s adjustable thermostat setting allows you select ranges from 250-375 degrees Fahrenheit and you can be alerted when the oil reaches your selected temperature via an indicator light. In addition, a viewing window enables monitoring of food as it fries, while the nonstick bowl is removable and easy to clean. The small size makes it easy to store on the kitchen counter and it is normally praised for its recovery times and rapid heat-up. However, there are very few concerns that its maximum temperature is not very high, that you have to change the charcoal filter from time to time and that there is no power button. You have to just plug and unplug. Although this device is easy to clean, it is not dish washer-safe and it is slower compared to the highly-priced models. The Presto 05420 FryDaddy is terrific for frying delicious chicken, onion rings, french fries and more at a very low price. With this deep fryer you do not require gallons of oil at home to fry food, as it makes 4 servings with just four cups of oil. This model does not use a basket but instead you place the food directly in the non-stick pot. This means that there’s no messy wire basket for cleaning but lifting out fried food has to be done by you manually. It is compact at 7” in diameter for easy storage and has an automatic thermostat that maintains frying temperatures between 325 and 350F. This fryer has a snap-on lid feature, letting you store oil in it for reuse. It also has nonstick surfaces for easy cleaning; however, it is not dish washer-safe. The Presto 05420 has a hand scoop for lifting, draining and serving food. Some people will be for this basket-less model while others against it, as you must let your food dry up on a rack or pat it down with a towel for a while before eating it. Even though the scoop is helpful, manually fishing out the food that’s done isn’t easy, as it can get too browned if you don’t get it all out quickly. The Presto 05466 2 Basket Pro Fry is very similar to the Presto Pro Fry 05461 above, except that this one has 12-cup capacity and two oblong-shaped stainless-steel baskets, making it great for frying two different foods at the same time and thus saving you a lot of time. You can add a maximum of 5 quarts of oil into this fryer, while the minimum amount is 3½ quarts. All the other features remain the same. There are concerns about its size with some people complaining that it takes up too much space. Not only can the 1700W T-fal Oil Filtration EZ Clean Fryer hold 3.5 liters of oil and cook up to 2.6 lbs of food, it can filter and drain the used oil so it can be used again the next time. The usual features, like adjustable temperature control, immersed heating element, odor filter and viewer window are all present. The three stages of operation of this machine are controlled by the external lever. When it’s set to fry, the food is cooked, when it’s set to filter, the used oil is filtered through a fine mesh stainless steel screen, and when it’s set to drain, the clean oil drains out into the plastic container below, which can be sealed to store before the oil is used again or you can pour it out into another container. All the parts excluding the heating element are dishwasher safe. There are safety features such as a thermometer in the draining system that won’t let the machine drain the oil if it is still too hot even if you select the drain setting. This is also useful if you start cooking with the setting accidentally on “drain”. Owners of the T-fal love that they need to change the oil less frequently because the patented filtration system is so good. They also love that everything is dishwasher safe. A couple reviewers mention that they would have liked the unit to go up to 400F instead of 375F. The Waring Pro DF280 is arguably one of the most advanced fryers on the market designed with the fried food enthusiast in mind. An 1800-Watt removable immersion heating element makes it very powerful and hence quick. It is also feature-rich with an adjustable temperature control and a 60-minute digital timer. A viewing window allows you to monitor the food without opening the lid. Similar to most Waring appliances, this device is built to last. It can cook 2.3 lb of food, hence great for family servings, and its handy 3-basket design (1 large and 2 small) makes it possible for you to fry a large quantity of 1 type of food and 2 smaller quantities of two other types. It requires a lot of cooking oil, about one gallon per use; however, you can reuse the oil on a few occasions depending on how well it is filtered. The Waring Pro DF280 has a removable bowl with pouring spout that is simple to clean and dishwasher-safe. Its stay-cool handles allow you to move it around without wearing oven mitts. Furthermore, it is simple to set up as no instructions are needed. However, this being a professional-style appliance, it occupies significant space on the kitchen counter. Its cord is magnetic and doesn’t attach too well to the appliance. It is also a bit more expensive compared to other deep fryers. ← Which is the Best Rated Bread Machine of 2018?